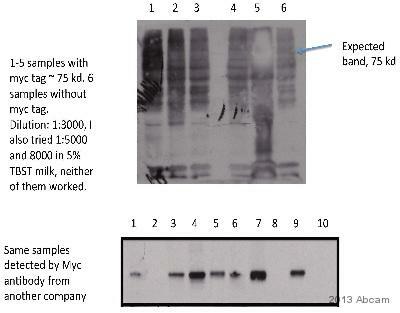 Rabbit polyclonal Myc tag antibody. Validated in WB, IP, IHC, ICC, Flow Cyt, EM, ICC/IF. Cited in 255 publication(s). Independently reviewed in 38 review(s). ELISA: Antibody specificity was verified by ELISA against the peptide (EQKLISEEDL). A 1:60,000 dilution of the antibody gave an O.D.=1.0 in a 15 minute reaction using HRP-conjugated Goat Anti Rabbit IgG at 1:20,000 and TMB as the substrate. Appropriate specificity controls were run. Synthetic peptide corresponding to Myc tag conjugated to keyhole limpet haemocyanin. ICC/IF: HeLa cells transfected with a Myc-tagged membrane targeting protein. IP: Huh7 cells expressing myc-tagged CDC42 protein. Human 293FT cells co-transfected with myc tagged cdc25 along with an HA tagged viral protein which binds to cdc25. Antibodies were immunoaffinity purified using the peptide immobilized on a solid phase. Antibody concentration was determined by extinction coefficient : O.D. 1.4 at 280nM equals 1.0 mg of IgG. Our Abpromise guarantee covers the use of ab9106 in the following tested applications. WB Use at an assay dependent concentration. Can be blocked with Human c-Myc peptide (ab13837). Electron Microscopy Use at an assay dependent concentration. See Abreview for further details (submitted by Eeva-Liisa Eskelinen). 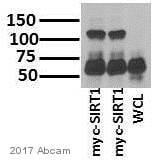 Western blot - Anti-Myc tag antibody (ab9106)Pais et al PLoS One. 2013;8(2):e56292. doi: 10.1371/journal.pone.0056292. Epub 2013 Feb 19. Fig 6. Y. enterocolitica ΔHOPEMT carrying plasmids encoding Myc-tagged CT082 or CT695, and HA-tagged Slc1 (as indicated) were grown in non-secreting conditions. Chloramphenicol was added (time?=?0 min) to stop bacterial protein synthesis and samples were taken at the indicated time points. Samples were analyzed by immunoblotting using ab9106, anti-HA, and anti-TEM antibodies. ab9106 staining the Myc tag in HeLa (Human epithelial cell line from cervix adenocarcinoma) cells transfected with a Myc-tagged membrane targeting protein by ICC/IF (Immunocytochemistry/immunofluorescence). Cells were fixed with paraformaldehyde, permeabilized with Triton X (0.5%) and blocked with 3% BSA for 1 hour at 24°C. Samples were incubated with primary antibody (1/500) for 1 hour at 24°C. 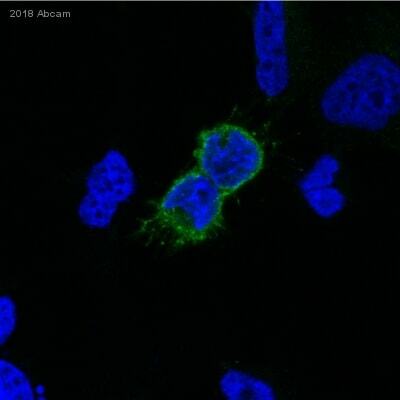 An Alexa Fluor®488-conjugated Goat anti-rabbit polyclonal was used as the secondary antibody. 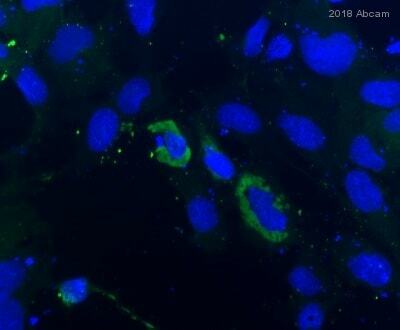 Immunoprecipitation - Anti-Myc tag antibody (ab9106)This image is courtesy of an anonymous abreview. ab9106 at 4 µg/mg lysate used in Huh7 (Human cell line) whole cell lysate (1x106 cells). 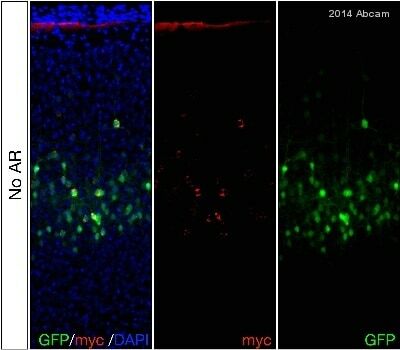 Cells expressed myc-tagged CDC42 protein. Immunoprecipitation step performed using Protein A matrix. Incubation time 4 hours at 4°C. Western Blot antibody used at 1/300 dilution. ab9106 used at 1/250 in the immunoprecipitation of transfected human 293FT cells (whole cell lysate). In this experiment cells were co-transfected with myc tagged cdc25 along with an HA tagged viral protein which binds to cdc25. The cell lysate was immunoprecipitated using ab9106, run on a 10% gel. The blot was probed for HA and HA tagged protein (which co-IPed with Myc tagged protein) and this is seen at ~15KDa. This image is courtesy of an Abreview submitted on 23 March 2006.
ab9106 at 1/2000 staining mouse embryonic fibroblasts expressing myc-tagged protein by ICC. The cells were paraformaldehyde fixed and blocked with 3% BSA prior to incubation with the antibody for 1 hour. 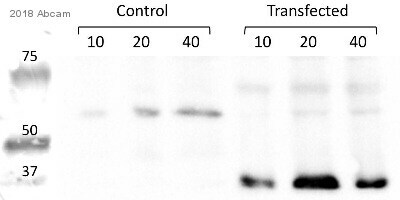 A goat anti-rabbit IgG antibody (10 nm gold conjugated) was used as the secondary. The image shown is immuno electron microscopical staining with thawed cryosections. Publishing research using ab9106? Please let us know so that we can cite the reference in this datasheet. Transfected with 10µg of expression vector encoding a Myc-fused protein. Cells tranfected with empty vector or myc-tagged SIRT1 followed by IP SIRT1. 2) There was no band on the blot. the band, I decided not to wast the downstream reagent. Unfortunately the delay wasn't from Abcam, we have shipped the product at correct temperature. Please check your delivery service and let them know these products are temperature sensitive and they need to be delivered without delays. We will be shipping a new vial as replacement to the next order of Nulife. Please make sure the customer gets this vial without delays. The new order number is 1229622.